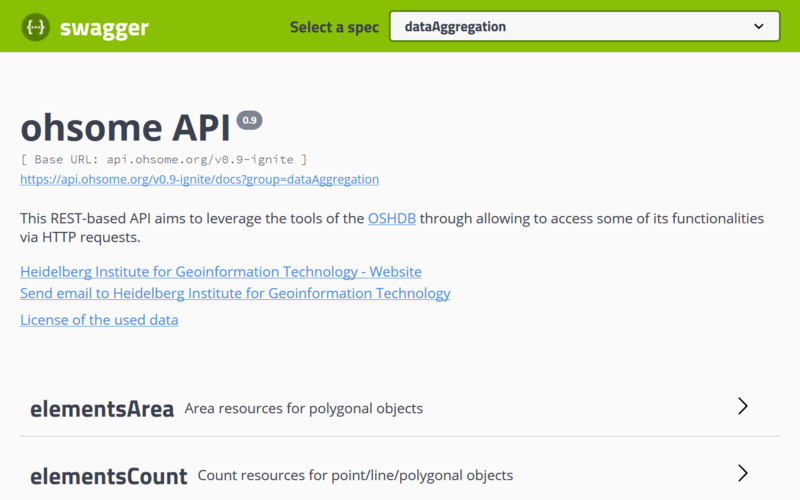 The Big Spatial Data Analytics team at HeiGIT is currently developing the ohsome platform. Our aim is to make OpenStreetMap’s full-history data more easily accessible for various kinds of data analytics tasks on a global scale. 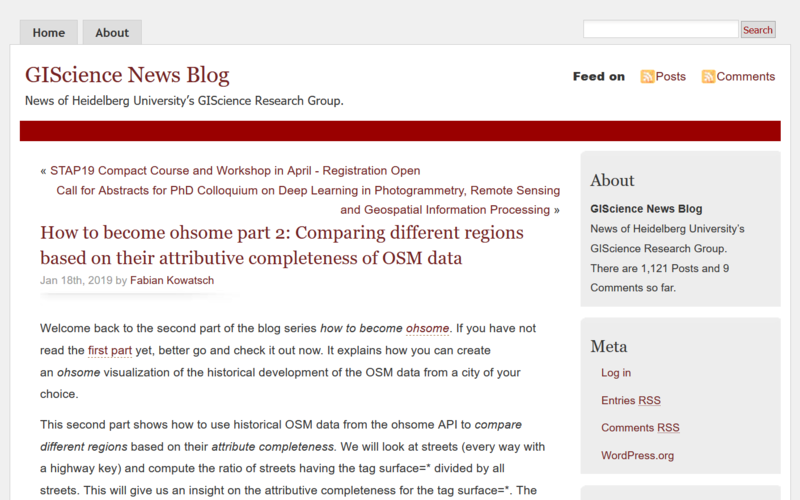 Applications of the ohsome platform range from web dashboards over data quality assessment to custom data analysis. The OpenStreetMap history dataset is large and, thus, requires efficiency in terms of storage size, data access and processing performance. These benefit from a custom-built, compact data representation and from parallelizing computations. Two generic interfaces (APIs) are available to enable arbitrary analyses for different user groups. The complex internal data representation is thus encapsulated in order to make it more user-friendly and easy to maintain. data by maintaining all properties of the original data including its errors. OpenStreetMap provides almost the entire editing history of its global data evolution. This dataset is large and, thus, generally hard to handle. The central idea of the ohsome platform is to make OpenStreetMap’s huge information treasure available for a larger public and to develop further analysis functionalities. We achieve this by employing big data technology that we tailored to the specific needs of OpenStreetMap’s history data. The OSHDB is the main data backend of the ohsome platform. It has been designed for efficient storage of and access to OpenStreetMap history data. In order to ensure the scalability of the system, we build on a partitioning schema which allows distributed data storage and parallel execution of computations. The OSHDB API provides an interface to the OSHDB in the Java programming language. We provide the OSHDB on our GitHub repository for everyone to use, and we appreciate the resourceful feedback we receive from the community. 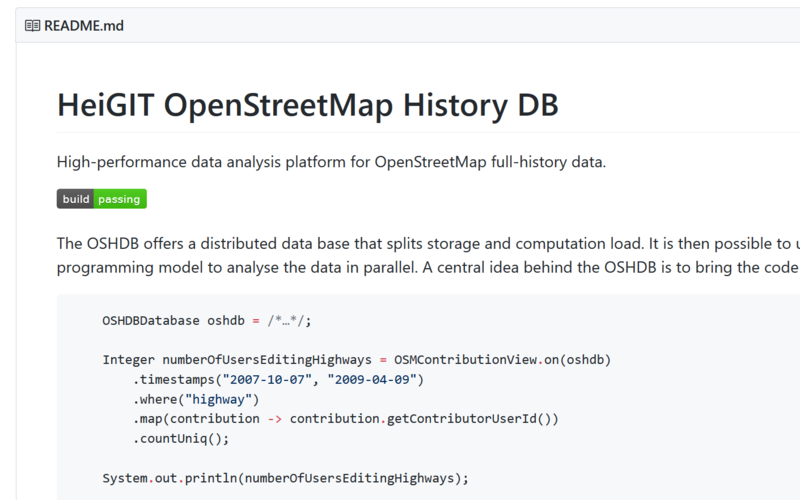 The ohsome API lets you analyze the rich data source of the OpenStreetMap history. Our REST-based API aims to leverage the tools of the OSHDB through allowing to access some of its functionalities via HTTP requests. You can either perform analyses using a dashboard-like application, or use the ohsome API directly and work with its CSV, JSON or GeoJSON responses. Get aggregated statistics on the evolution of OpenStreetMap elements and specify your own temporal, spatial and/or thematic filters. The data aggregation endpoint allows you to access functions, e.g., to calculate the area of buildings or the length of streets at any given timestamp. Interested in how many users have contributed to OpenStreetMap? Get the number of contributors at any custom time period for your area of interest. The users endpoint also allows you to apply different filters, e.g., to find out how many users have edited street names. Retrieve the geometry of the historical OpenStreetMap data, e.g., to visualize the evolution of certain OpenStreetMap elements over time. With our ohsome data extraction endpoint you can get the geometries for specific points in time or all changes within a timespan (full-history). Generating accurate statistics about the historical development of OpenStreetMap data for an arbitrary region is now as easy as pie. 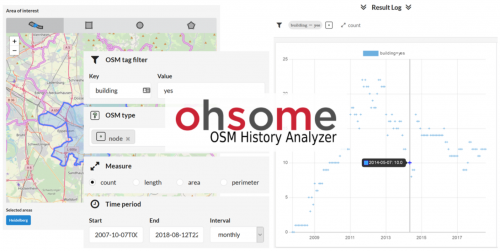 The ohsome dashboard allows custom filtering of all available OpenStreetMap tags and types and includes administrative boundaries, making the selection of search areas easier.